Saying goodbye can be among the hardest things to do in life. That's why there are so many good songs about the process, and not all of them are found in the country music catalog. In fact, Scandal's Goodbye to You, an upbeat rocker, is among the best of the bunch. Patty Smyth's searing lyrics make this song an unforgettable experience for the listener. The reason CTN was thinking about saying goodbye as he prepared this week's Crashing the Net is because it is time to say goodbye to almost half of the NHL's 30 teams. Come Sunday, 14 teams will be done for the season, left to watch helplessly as their 16 peers advance to the postseason. CTN thought about using Pantera's Cemetery Gates to talk about the goodbye process, but decided to go in a different, less harsh direction. The 14 teams that don't advance are forgotten, for the most part, as attention turns to the race ahead instead of the race just completed. There is precious little time to do after-action reports in the spring of an NHL season. Simply, there is too much other stuff going on. So CTN decided to take a step back from the building playoff fever to take the time to give the NHL's eliminated teams a proper sendoff. Unfortunately, CTN only can say goodbye to 10 of the 14 teams that are shutting down shop at the regular season's conclusion. Four teams that aren't in the top 16 spots -- Buffalo, Washington, Chicago and Vancouver -- still have playoff hopes as the season enters its frantic four-day fight to the finish line, so we don't want to say premature goodbyes to those teams. Therefore, they are not included in this exercise. For the 10 eliminated teams, though, it is time to remember the good times and the bad from the 2007-08 season, and thank each of the clubs for the memories they provided the NHL fan this season. And unlike Patty Smyth, who is giving her boyfriend the final kiss-off in Goodbye to You, CTN knows he will welcome all these teams back into the fold next season, eager to see what they can do to re-win CTN's affection. In fact, the hope for the future is the theme for each team's goodbye missive. Atlanta -- At the start of the season there was so much to like about this team. It was coming off its first playoff appearance and looked to have the pieces in place to continue the climb to respectability. But things went horribly wrong and the Thrashers finished the season in a free fall. Can they bounce back? You bet they can. They have some pieces in place, for sure. Despite the beating he has taken in the media, GM Don Waddell is a pretty astute fellow and he can guide the renaissance. Kari Lehtonen has not developed as expected in goal, but he still is young enough to turn it around. Ilya Kovalchuk is as dynamic a scorer as there is in the game, and Tobias Enstrom is one of the most polished young defenseman to come along in a long time. Plus, late-season addition Colby Armstrong is going to provide some of the accountability that must be injected into this organization. Columbus -- This is the first Ken Hitchcock-coached team -- at least, coached for a full season -- that will miss the playoffs. But don't expect Hitch to miss the postseason two years in a row. CTN firmly believes the Blue Jackets will make the postseason for the first time in franchise history next seasons. The pieces clearly are in place. Goalie Pascal Leclaire finally has delivered on expectations and approached the franchise goalie status predicted for him when he was drafted. Rick Nash has become a better player under Hitchcock's system and remains the best power forward nobody pays attention to. Heck, even Nikolai Zherdev has seemed to find has way after almost being written off. On the blue line, the duo of Rusty Klesla -- not yet as good as predicted, but still solid -- and Ron Hainsey -- one of the League's most underrated defenseman -- are good building blocks. The Blue Jackets played everybody hard this year and made teams work for their points. Next year, Columbus will take those same points more often than not. CTN is confident in making that statement. Edmonton -- Was there a team in March more fun to watch than the Oilers? Well, maybe the Capitals, but that is it. Early on, the Oilers struggled and were left for dead by all but the true believers. But this is a team that took the never-say-quit attitude of coach Craig MacTavish and just kept plugging away. A ridiculously young team, they grew up right before our eyes, and it was an amazing maturation to watch. So many players stepped to the forefront during the season. Sam Gagner shocked many by making the team out of camp. Yes, he hit some lulls during the season, but he was more than solid. Tom Gilbert was great as a young blueliner. 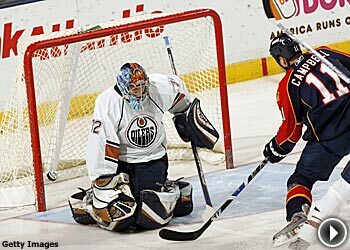 Curtis Glencross was a solid addition from Columbus. Kyle Brodziak is a sandpaper-type player who always looks good playing for a MacTavish-led team. Fernando Pisani came back from a career-threatening illness to contribute. In the end, there almost were too many feel-good stories to count in Oil Country, and none were better than the career revitalization enjoyed by goalie Mathieu Garon. The career journeyman stole the No. 1 job and played brilliantly -- especially in the shootout -- to get Edmonton to within three points of a playoff berth before the dream ended earlier this week. Florida -- Most likely, something is going to have to give with the Panthers. Jacques Martin is one of the few coaches to also handle GM duties, and that dual responsibility hasn't allowed him to deliver the results wanted -- mainly, a berth in the postseason. The Panthers have the blocks in place to be better in quick order, though. Goalie Tomas Vokoun has proven he can carry a team to the playoffs -- he did it in Nashville and he has been good for long stretches in Florida. He needs to be more consistent, though. Jay Bouwmeester is a franchise defenseman that doesn't get the credit he deserves. And Olli Jokinen is a big, No. 1 center that most teams can only dream about. Plus, many of the team's younger players have made huge strides. Nathan Horton, Stephen Weiss and David Booth all made big steps in their development this year, but more has to happen here for the Panthers to be considered a playoff team. Fortunately, though, they are not that far removed from the accomplishments of their Southeast Division peers, so such improvement should not seem overly daunting for either the team or its fans. Los Angeles -- You usually need sunglasses in Los Angeles, but the brightness of the Kings' future makes it almost mandatory to don the shades. This team is just loaded with young talent on the cusp of becoming prime-time players. Any franchise happily would accept a young core that included players like Anze Kopitar, Mike Cammalleri, Dustin Brown, Patrick O'Sullivan and Jack Johnson. If management can keep that group together for the long-term, you are looking at a dynasty in the making. But that only will happen if the Kings can find a goalie to carry the load. The club tried seven different keepers this season without success. Erik Ersberg has been one of the more pleasant surprises of the season, but he does not yet have the pedigree or resume of a franchise goalie. But Jonathan Bernier does. The young goalie just finished his final year of junior eligibility and is considered the Kings' goalie of the future. Could that future start next season? That will be one of the most pressing questions of the 2008-09 season. CTN knows one thing -- if this team ever does find a reliable goalie and a few depth defensemen to fill out the blue line, the Kings will be back in the playoff picture before you can spell Cammalleri. New York Islanders -- There was no late-season magic this time around. The Islanders couldn't stay alive long enough to pull off another last-game miracle like last season's memorable win in New Jersey. A never-ending run of injuries and an almost incomprehensible inability to score for long periods of time doomed this team to also-ran status and made GM Garth Snow's aggressive summer signings look like a bust. Plus, the late-season hip injury to franchise goalie Rick DiPietro didn't sit well with Islanders faithful. The injury required surgery and means DiPietro has missed the final few games of each of the last two seasons because of injury and the resulting corrective surgery. Last season, he needed surgery on his other hip. But there always are positives to be taken out of any situation and that also is the case here. First, in the face of almost unceasing adversity, the team never stopped working for coach Ted Nolan. He clearly is the right coach to get this team to where it wants to be. Plus, the run of injuries resulted in the Islanders being forced to test their organizational depth in ways that could not be imagined. For the most part, the organization passed the test, blooding a number of young players. Kyle Okposo, the most well-known of these prospects, looked good in his end-of-season call-up. Phoenix -- For a while in February and early March, it looked like the Coyotes were going to make the Stanley Cup Playoffs. Read that sentence again and you will understand just how good a season it has been in the desert. Wayne Gretzky should get some serious consideration for coach of the year, and a case can be made that goalie Ilya Bryzgalov, a waiver-wire pickup from Anaheim, should get some support for Most Valuable Player. He also has staked his claim to the No. 1 job with the Coyotes and infused the organization with hope that it has settled its long-standing goalie issues. 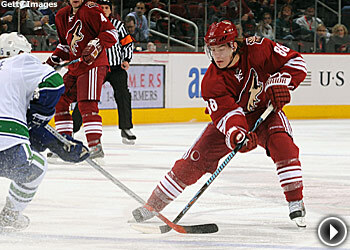 Plus, the Desert Dogs saw their youth movement start to pay off, especially with the better-than-expected play of Peter Mueller, the club's 2006 first-round pick. Obviously, the club is confident it has the depth necessary to make the jump to the next level because it successfully resisted the temptation to move assets at the trade deadline to make a long-shot run at the postseason. The flip side to that faith, however, is the expectations of tangible results. That means the pressure will be on to make the postseason next year. Can the Coyotes do it? It won't be easy, but CTN thinks the answer is yes. St. Louis –The Blues' season went off the proverbial rails in the last two months, obscuring what had been a good season to that point. So the question remains: Were the Blues winning by smoke and mirrors in the first four months, or is the bad run to close the season just plain bad luck? CTN likes to think it is the latter. Andy Murray has proven that he is a good coach, so he shouldn't be questioned at this point. He has a system of on-ice accountability for his players, which is effective in today's NHL. The Blues clearly need more depth -- both on the blue line and up front -- but they are producing young players. David Perron, a 2007 first-round selection -- one of three first-rounders taken by the Blues -- surprised everyone but himself by not only making the team as an 18-year-old, but also playing well when given the opportunity. The Blues will need even more players to follow Perron's lead next year if they want to return to the postseason party. The picture may not look too bright right now for the Blues, but CTN believes team president John Davidson has this franchise on the proper path. Tampa Bay -- This is a team only four years removed from winning the franchise's first Stanley Cup. Today, they sit in the basement of the Eastern Conference. What the heck happened? Almost too much to document, that is for sure. But the team has suffered the vagaries that come with the lack of a franchise goalie, something the club has missed since letting Cup hero Nikolai Khabibulin walk away. But the front office thinks they have a new goalie stud in Mike Smith, the centerpiece of the late-season trade that moved franchise icon Brad Richards to Dallas. If that is the case, he should mesh nicely with the remaining Big Three -- Vinny Lecavalier, Martin St. Louis and Dan Boyle -- to give the Lightning the nucleus to improve. The question that remains, however, is if GM Jay Feaster can surround that high-priced core with enough depth to weather an 82-game schedule and produce more wins than losses in the process. Toronto -- Three years without a playoff appearance in Toronto -- what is the hockey world coming to? There's no denying that things are a mess in TO. The club hoped to turn over its roster at this spring's deadline, but was rebuffed at virtually every turn. Captain and elder statesman Mats Sundin was attacked for his unwillingness to waive his no-trade clause. Now there is uncertainty about whether or not he will be back next season. As it stands now, the club is older than anybody would like to see. It also needs a GM ready to pull the trigger on some bold moves once a replacement for interim GM Cliff Fletcher is identified. On the ice, though, there are some positives that suggest the postseason drought is almost complete. Vesa Toskala came over from San Jose and played like a legitimate No. 1. And the Leafs have identified some younger players -- Jiri Tlusty and Anton Stralman jump to mind -- that can be part of the rebuilding process. But there is no question the Leafs will have to be incredibly aggressive and creative in the coming months to find a way out of their current predicament.